Experienced moms have a message for pregnant women: Wake up and start saving for college today, according to a NerdWallet survey of more than 1,200 mothers nationwide. NerdWallet polled more than 600 pregnant women and 600 mothers with teenage children to gauge the money fears of expectant mothers against the experience of seasoned moms. Although pregnant women are more concerned about costs of health care and making a financial checklist before the baby arrives, nearly 44% of mothers with teenagers now wish they’d been advised to start saving for college immediately after their children were born. “With the cost of college education growing much faster than inflation, families with older children are finding themselves financially unprepared,” says Farnoosh Torabi, a correspondent for NerdWallet. Both groups of mothers agreed on one financial issue: The choice to go back to work for additional family income was the top source of marital tension surrounding the birth of children. About 31% of expectant mothers and 30% of experienced mothers said the decision to stay at home or return to work was the No. 1 reason they fought with their spouse. The survey results paint a picture of the financial conundrum modern American mothers face surrounding childcare. The difficult choice to stay at home to closely raise children competes with the desire to continue a career and ease the economic fallout of having a child. The latter choice, however, comes back to haunt some families economically as their children approach college age. Over the last decade, the average published tuition and fees at public, four-year schools have risen a whopping 42%, adjusted for inflation, according to the College Board (PDF), a private association that includes more than 6,000 colleges, universities and schools. A woman’s choice to leave a career has strong financial implications for families as annual earnings decline by 30% after two to three years outside the workforce, according to the Institute for Women’s Policy Research. Nearly 30% of American moms are now setting aside careers to stay at home to care for their children, compared with 23% of mothers in 1999, reports the Pew Research Center in findings published last year. The rise is attributed to the skyrocketing price of daycare. The cost to send an infant to daycare is now higher than in-state college tuition and fees in 31 states, according to a report from Child Care Aware America. Pregnant women crave guidance on whether to stay at home with their children; it’s the No. 1 piece of advice they want to hear. 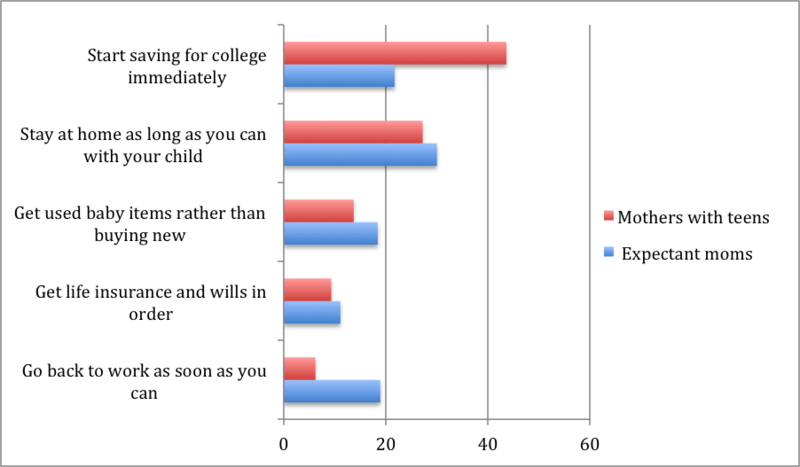 Experienced mothers, by far, wish they had started saving for college immediately. But the No. 2 bit of advice they wish they’d heard? Stay at home as long as you can with your child. “This shows the deep ambivalence about the practical realities of increasing income to support the family and the emotional pull to have those precious years together with their children at home,” Torabi says. Question: As the mother of a teenager, what advice do you most wish you’d received as a new parent? 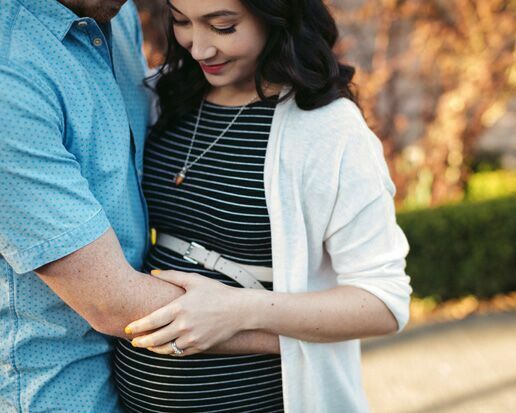 Question: What advice would you most like to hear as an expectant mom? Expecting and experienced mothers agreed that they argued with their spouses most about whether to go back to work, ahead of concerns such as the cost of childcare and saving for college. For experienced mothers, arguments with their spouse arose over the costs of entertaining their children with toys and extracurricular activities; 23.5% reported arguments over these expenses, the second-highest source of tension after the decision to go back to work. Question: If married, what financial matter did you argue about most with your spouse when you had your baby? Question: If married, what financial matters do you and your spouse currently argue about the most related to the baby? SurveyMonkey collected data for 604 pregnant women and 613 mothers with teenage children from March 16 to 23. Respondents came from across the United States. Women were at least 18 years old; 60.7% of mothers with teenage children were between the ages of 30 and 44; 55.3% of pregnant women were ages 18 to 29. About 49% of mothers with teens and 44% of expectant mothers had a household income of $25,000 to $75,000. Having a baby? Get started with this checklist. Image via iStock; infographic via Sydney Buffman.